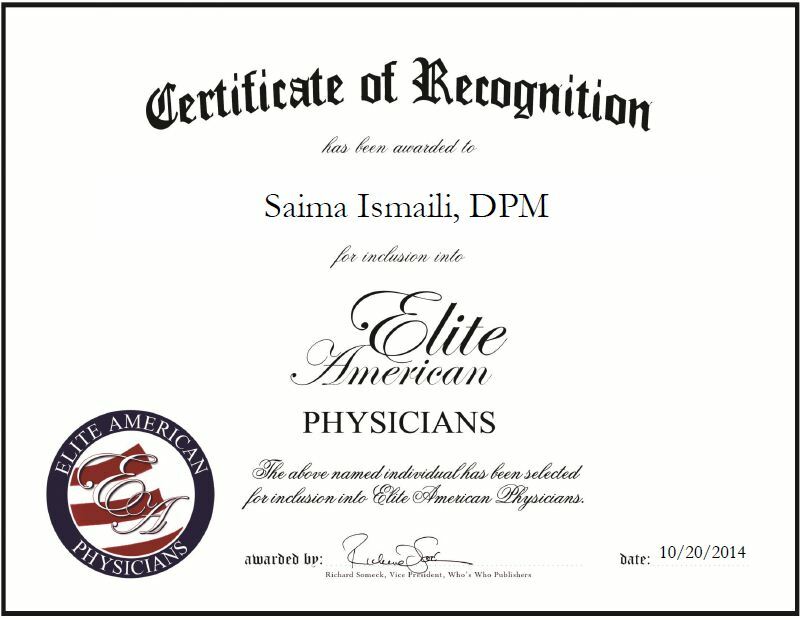 Charleston, SC, October 20, 2014, Saima Ismaili, Doctor of Podiatric Medicine for Carolina Foot Centers, has been recognized by Elite American Physicians for dedication, achievements and leadership in podiatry. Due to her family members’ foot conditions, Dr. Ismaili was able to understand what a podiatrist did at an early age. She was intrigued by the field and knew she wanted to help people, and made the decision to pursue a career in the specialty. Dr. Ismaili has been in her field for nearly a decade and recently started at Carolina Foot Centers. Dr. Ismaili is a highly regarded physician who specializes in foot and ankle pain, as well as diabetic foot care. Her goal is to help her patients with diabetes understand that their pain needs special attention and that lack of care, until it’s too late, can lead to the need for amputation, which might be preventable with podiatric care. Dr. Ismaili spends her time seeing approximately 30 patients per day and working closely with them to treat their foot and ankle health issues. Dr. Ismaili is board qualified by the American Board of Podiatric Surgery and is trained in all phases of podiatric medicine and surgery. She attributes her success to her training, drive and supportive family. In the coming years, Dr. Ismaili plans to establish better patient care and expand and improve her practice. This entry was posted in Podiatry and tagged diabetes, foot and ankle care, pain, patient care, Podiatric Medicine, surgery. Bookmark the permalink.